When entering a synagogue for a prayer service, wedding, or other life cycle event one of the most commonly asked questions is what to wear. Beyond the basics of clothing choice, the elements of Jewish ritual garb can also be confusing. Yarmulkes or kippot (skullcaps), tallit (prayer shawls) and tefillin (phylacteries) can seem strange to the uninitiated. But each of these items has symbolic meaning within Judaism that add to the worship experience. While each synagogue will have its own customs and traditions when it comes to what is appropriate attire, here are some general guidelines. In some synagogues, it is customary for people to wear formal attire to any prayer service (suits for men and dresses or pants suits for women). In other communities, it is not uncommon to see members wearing jeans or sneakers. Since a synagogue is a house of worship it is generally advisable to wear “nice clothes” to a prayer service or other lifecycle event, such as a Bar Mitzvah. For most services, this can be loosely defined to mean business casual clothing. When in doubt, the easiest way to avoid a faux pas is to call the synagogue you will be attending (or a friend who attends that synagogue regularly) and ask what is appropriate attire. No matter what the custom is at the particular synagogue, one should always dress respectfully and modestly. Avoid revealing clothing or clothes with images that may be deemed disrespectful. This is one of the items most commonly associated with Jewish ritual garb. In most synagogues (though not all) men are expected to wear a Yarmulke (Yiddish) or Kippah (Hebrew), which is a skullcap worn on the apex of one’s head as a symbol of respect for God. Some women will also wear a kippah but this is usually a personal choice. Visitors may or may not be asked to wear a kippah in the sanctuary or when entering the synagogue building. Generally if asked you should don a kippah whether or not you are Jewish. Synagogues will have boxes or baskets of kippot at locations throughout the building for guests to use. Most congregations will require any man, and sometimes women as well, ascending the bimah (a platform at the front of the sanctuary) to wear a kippah. For more information see: What Is a Kippah? In many congregations, men and sometimes women will also don a tallit. These are prayer shawls worn during the prayer service. The prayer shawl originated with two biblical verses, Numbers 15:38 and Deuteronomy 22:12 where Jews are instructed to wear four-cornered garments with tasseled fringes on the corners. As with kippot, most regular attendees will bring their own tallit with them to the prayer service. Unlike kippot, however, it is much more common for the wearing of prayer shawls to be optional, even on the bimah. 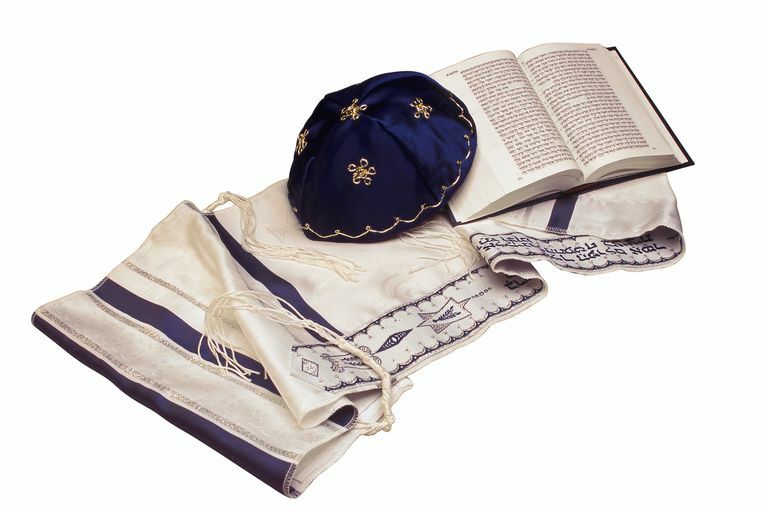 In congregations where many or most congregants wear tallitot (plural of tallit), there will usually be racks containing tallitot for guests to wear during the service. Seen mainly in Orthodox communities, tefillin look like small black boxes attached to the arm and head with winding leather straps. Generally, visitors to a synagogue are not expected to wear tefillin. Indeed, in many communities today - in the Conservative, Reform and Reconstructionist movements - it is uncommon to see more than one or two congregants wearing tefillin. For more information on tefillin, including their origins and significance see: What Are Tefillin? In summary, when attending a synagogue for the first time Jewish and non-Jewish visitors should attempt to follow the customs of the individual congregation. Wear respectful clothing and, if you are man and it is the custom of the community, wear a kippah.